South Queensland anglers are lucky enough to have a set of sand islands as a great range spots for fishing. Bribie, Moreton, North and South Stradbroke Islands all form a chain of fishing options and each island is different in what is available. Arguably, the best of the options is Moreton Island. Even though is can be difficult and expensive to access, the rewards are available with a wide variety of fish species across the seasons and protected spots to access during all weather conditions. Local bait is available with pippies and beach worms from the eastern beach. Marine yabbies can also be accessed as well as small baitfish like, hardyheads and poddy mullet gathered with a bait net. Bait and tackle shops are available from both ends of the island as well as ice and food, etc. Sand whiting, flathead, dart, bream and tailor all are targeted with whiting and flathead in summer and dart ,bream and tailor in winter but be prepared for a variety of fish at any location. Trevally, longtom, mackerel and reef fish can all be taken off the various beaches to the surprise of anglers. The two main areas are around Yellow Patch to the north and Long Point to Reeders Point at the south end. Shallow eastern beach gutters are also good especially during calm weather or with an offshore breeze prevailing. Live worms will increase your chances of a better catch. The western beaches often fish better at night around the top of the tide. These are prolific most of the year but school in large numbers during winter. Dartcan be caught in semi-surf to surf conditions and can often be seen in the lifting waves. Will bite on almost any bait but like pippies and yabbies during daylight hours and worms at night. Great fun on light gear. Like tailor they should be bled upon capture. 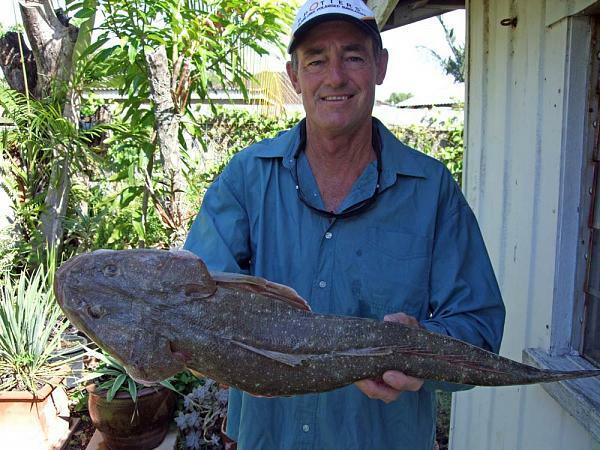 Flathead are mainly targeted from September to April along the western side of Moreton. These bottom dwellers lay in the shallow water close to the beach and inexperienced anglers or swimmers often accidentally scare the fish back into the deeper water. They prefer structure like old snags in the water or around creek mouths. The water around the western beaches is normally that clear that lure fishers struggle to catch lizards with bait the best and most consistent option at this location. Winter months are the most reliable time to catch tailor especially along the eastern beach gutters. They can vary in size from small choppers less than a kilogram up to big greenbacks over five kilograms. The type of tackle must vary depending on the size of the fish but wire traces are often used when being repeatedly bitten off. Pilchards are a great bait but tuna and bonito flesh will catch the bigger ones. Spinning off the beach with metal lures is also great fun, especially when the fish are wide out and hard to reach with casted bait. Bream are caught island-wide but are more prevalent in winter. They are often caught alongside dart and tailor and form part of a mixed bag in the surf. Try around rocky gutters on both sides of the island and you will normally catch some bream or tarwhine bream. They tend to forage better at night but are taken scavenging around tailor and sea mullet schools. Always wear polarised sunglasses for eye protection and improved water vision. Take sun protection, like a hat (not cap) and long sleeved clothing with UV cream a must. Insect repellent is also advised. Protective footwear is required for wading in the shallows. Stingrays and bluebottles are a constant menace. Keep an eye on the weather and forecast wind direction and try to fish with the wind on your back. It is more pleasant and often more prolific. Try to travel around low tide and be aware of fresh water run outs. Drive cautiously as beach conditions change frequently. Small townships and beach pedestrians should be respected. Be extra careful around the northern rocks at Cape Moreton and North Point. Fishing here is for experienced anglers only.